During my many years as Director of the Scottish Tartans Authority, one of my favourite pursuits – but one that I had never enough time for – was historical research. One of those portraits of course, was of John Brown. It’s said that the Queen’s family and friends often teased her about him – some affectionately and others no doubt maliciously – and to counter that, she’s said to have ordered MacLeay to modify his portrait of Brown to make him less ‘rural’ and more urbane. 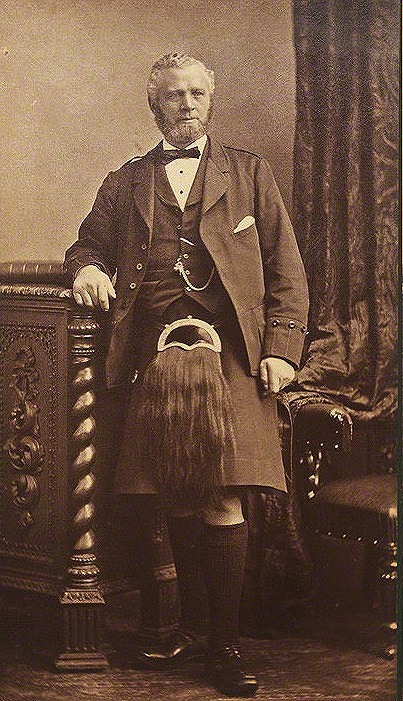 The result is an unrecognisable transformation in which MacLeay has done away with Brown’s thick ankles; rather dumpy legs; comfortable waistline; homely shoes; crumpled, everyday clothing; grey hair and aging face and turned him into a tall and handsome figure whom Victoria’s friends might well have wished for their own personal servant. I discovered the care-worn portrait of Brown in a small hardbound book from the same publisher featuring all the portraits in black and white. Also in the Authority’s library was a second edition of that book but this time, leather-bound and gold-tooled. But . . . surprise! . . surprise! The care-worn portrait of Brown has been replaced with the tall handsome version! Did the publisher perhaps get a Royal slap on the wrist for including the ‘before’ instead of the ‘after’? The mystery doesn’t finish there however although this further anomaly isn’t quite so exciting. MacLeay’s watercolours are amongst the most prized and accurate illustrations of the tartans and Highland dress of the time and, being essentially a painter of miniatures, the degree of detail was remarkable – one can even see the hairs on the legs of the individuals – if you like that sort of thing! To achieve such results, MacLeay had sittings with all his subjects . . . . or did he? Below is a strangely familiar study of John Brown but this time, a photograph by Cornelius Jabez Hughes, bought by the National Gallery in 1980. Switch to MacLeay’s portrait and it’s almost as if he’d scanned and ‘Photo-shopped’ the Hughes’ photograph, replacing the studio background paraphernalia with more rural items. Perhaps Brown was too busy to sit for MacLeay or perhaps he was a bit rebellious and refused to take part, requiring MacLeay to use the only reference he could find? Perhaps some serious historian will read this and correct any inaccurate assumptions. 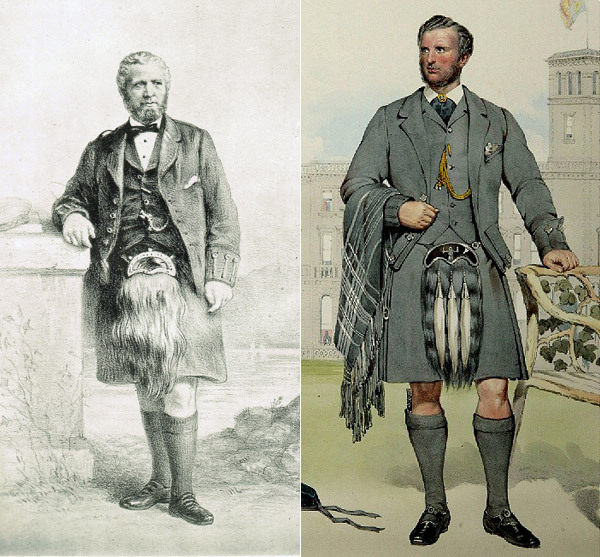 I’ve made no mention of tartan at all for the simple reason that Brown insisted that he had no tartan and wore a plain grey kilt – something that was made plain in both portraits and the photograph.